The Mailchimp module for PrestaShop adds your PrestaShop store customers and their order details to your Mailchimp list. Use PrestaShop data to track sales, create targeted e-commerce campaigns, generate custom product recommendations, and more. In this article, you'll learn how to connect and disconnect Mailchimp for PrestaShop. 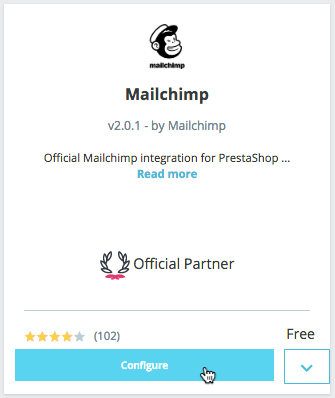 The Mailchimp module for PrestaShop works with all versions of PrestaShop 1.6.0.4 or higher. To view the e-commerce features supported by this integration, visit the PrestaShop listing in your account. Abandoned Cart automations are not compatible with guest checkouts in Prestashop 2.0 or higher. To create a new list when you connect to Mailchimp, your Prestashop contact information must include a physical address. When you connect your PrestaShop store to Mailchimp, we'll update your Mailchimp list, or create a new list, with each customer's email address, name, and order information. To create a new list, your store contact information must include a physical address. We'll also generate a permission reminder for customers who opt in to receive your email marketing. To change the contact information or permission reminder for a list after it's created, edit its required footer content in Mailchimp. Customers who opt in to your list at checkout are imported as subscribed contacts, while customers who choose not to receive marketing emails will appear as non-subscribed contacts. You'll collect more contacts as new people purchase from you, and future orders will sync automatically. New subscribers will follow the opt-in settings set for the connected list. If you have double opt-in enabled, new subscribers will receive a confirmation email before being added. Log in to your PrestaShop store back office. In the left navigation menu, click the Modules drop-down and choose Modules & Services. On the Modules Selection page, find the Mailchimp module and click Install. After the integration installs, click Configure. On the Config page, click Setup wizard to connect your Mailchimp account. On the LOG IN TO MAILCHIMP tab, click Log in to Mailchimp. In the pop up window, enter your Mailchimp credentials and click Log In. Choose an existing list in your account and click Next. Map your order notifications and click Next. Follow the prompts to sync your shop, products, customers, and promo codes. All set! Once your store completes its sync, setup is complete. The time it takes to sync depends on the size of your list and the number of orders in your store. 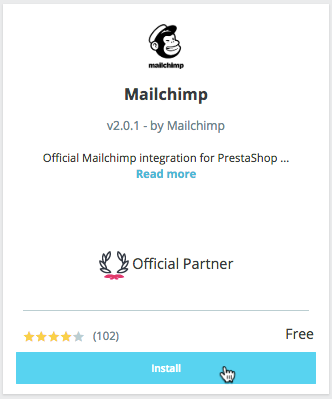 After you install Mailchimp for PrestaShop, you can visit the Connected Sites page in your account to view details for your PrestaShop store. Here, you can see the status of the integration or add and manage e-commerce features like pop-up forms, e-commerce automations, and more. For the latest features and best performance, make sure to use the most up-to-date version of Mailchimp for PrestaShop. To update Mailchimp for PrestaShop, follow these steps. 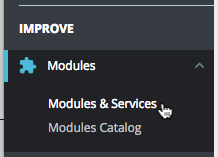 On the Modules Selection tab, find the Mailchimp module and click Update it! That’s it! Now you’ll have the latest version of Mailchimp for PrestaShop. For each notification you enable in Mailchimp, you'll need to disable its counterpart in PrestaShop. If you're having trouble with your store connection, you may want to uninstall and re-install the Mailchimp module for PrestaShop. To uninstall the Mailchimp for PrestaShop module, follow these steps. Log in to your PrestaShop administration screen. In the left navigation menu, click the Modules drop-down and select Modules & Services. On the Installed modules tab, search for Mailchimp. Find the Mailchimp module, click the drop-down menu, and choose Uninstall. That's it! You have successfully uninstalled the Mailchimp for PrestaShop module. To re-install, follow the steps to connect your store. After you connect your PrestaShop store to Mailchimp, we'll enable e-commerce tracking on your campaigns so you can use e-commerce segmentation, automation, and reports, as well as custom product recommendations.